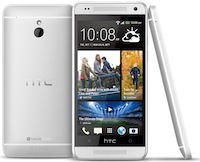 Taking a cue from Samsung, HTC has also launched a compact version of the company's flagship smartphone HTC One. Christened HTC One mini, the device sports a slightly smaller 4.3 inch screen, in comparison to the 4.7 inch screen of HTC One. Similar to its big brother, this one also runs on the Android operating system, and comes with HTC BlinkFeed, HTC Zoe and HTC BoomSound, among others. This one features a 4.3 inch HD Super LCD2 capacitive touchscreen display and runs on the latest Android 4.2 (Jelly Bean) operating system with HTC Sense 5 user interface. It is powered by a Qualcomm 1.4 GHz dual-core processor and has 1 GB RAM. The device offers 16GB of internal memory and 25GB of Dropbox storage. The smartphone has a HTC UltraPixel camera (with BSI sensor and HTC Zoe) that can record videos and a 1.6 mega pixel front facing camera that can record high definition videos (720p). The camera includes an f/2.0 aperture lens and a sensor with UltraPixel that the company claims gathers 300 per cent more light than traditional smartphone camera sensors, providing good low-light performance. On the connectivity front, the device has Bluetooth 4.0, Wi-Fi, 3G, and a microUSB port. HTC One mini measures 132.2mm x 63.2mm x 9.25mm and weighs 128 gm. Available in glacial silver and stealth black colours, the smartphone also has a 1,800 mAh battery. HTC BlinkFeed: A live stream of relevant information such as social updates, entertainment and lifestyle updates, news and photos on the home screen itself. It aggregates the latest content in one place, without the need to jump between multiple apps. HTC BoomSound: Introduces front-facing stereo speakers with a dedicated amplifier. Also, the BeatsAudio integration is enabled across the entire experience (listening to music, watching a YouTube video or playing a game). HTC Zoe: Brings special moments to life in three-second videos, enabling a range of advanced editing capabilities and creative flexibility. If you want to compare the specifications of the device with the HTC One in detail, you can do the same here. While launching a small screened version of its flagship is a smart idea, pricing it at over Rs 35,000 not so much. In comparison, the Galaxy S4 mini is available for only Rs 21,691. In its price range, the device will compete with the likes of Nokia Lumia 925 (Rs 33,499), Sony Xperia Z1 (Rs 39,999), Galaxy S4 (Rs 39,999), LG G2 (Rs 40,490), among others. We personally feel that instead of spending so much on a mini version of a smartphone, you can opt for one of the smartphones mentioned above. Alternatively, HTC can get its pricing right for a change (by slashing the price post launch).